I don' t know about you ladies, but being a figure skater has always been a dream of mine. The cute little skirts, the sparkly leotards and dancing on ice looking like a little princess, yes, that was what I wanted to do. I did go ice skating often as a child but never was able to get to the skill of Kristi Yamguchi without lessons, but I could have possibly found the next best thing. 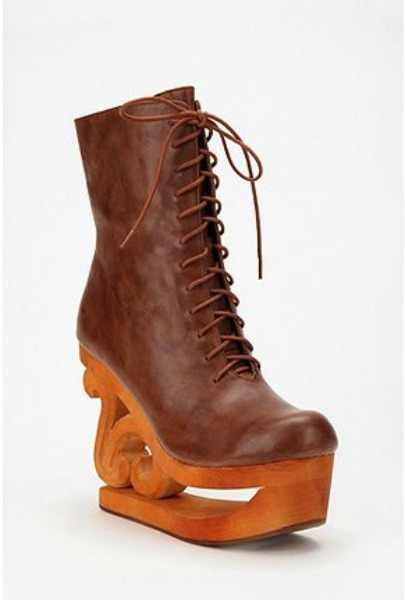 The Ice skate boot! Yes, you've read correctly, boots that resemble an actual ice skate. They've been seen on the feet of Beyonce, stylist June Ambrose and video model turned cosmetic line owner Keyshia Dior, and they make them look fab. I love them, but what do you guys think?